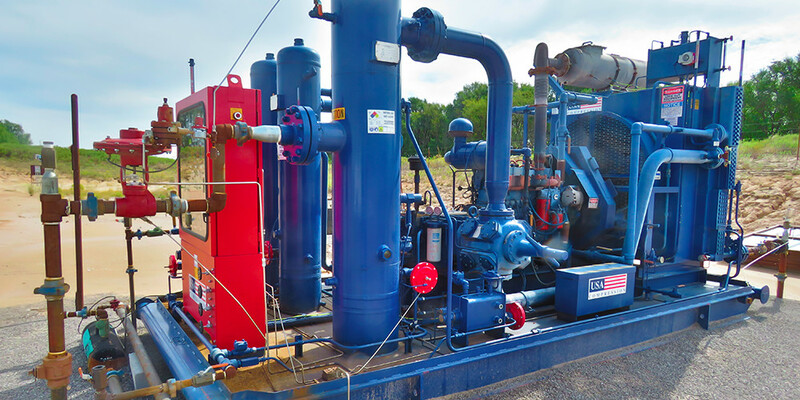 Gas Lift can be the most economical process for artificially lifting oil and gas wells and the applications can be complicated. We recognize the complexity that gas lift applications provide and have professionals that market, engineer and service only the gas lift market through our dedicated gas lift service team. Our service technicians provide the highest level of service in the business, and this team services only our 1800 unit fleet. Gas lift compression is our focus and our business. We offer nine; specially designed gas lift packages that are designed for gas lift operations. The packages range from 47 horsepower to 380 horsepower. Our unit designs offer up to 1600 PSIG discharge pressures, three stages of compression, unit scrubbers that are 75% larger than our competition to handle the large amounts of fluids usually common on gas lift applications, four runner portable skids for easy installation, Caterpillar and Cummins engines with Ariel and Gemini Compressors and the EICS engine management systems that operate on higher BTU fuels.